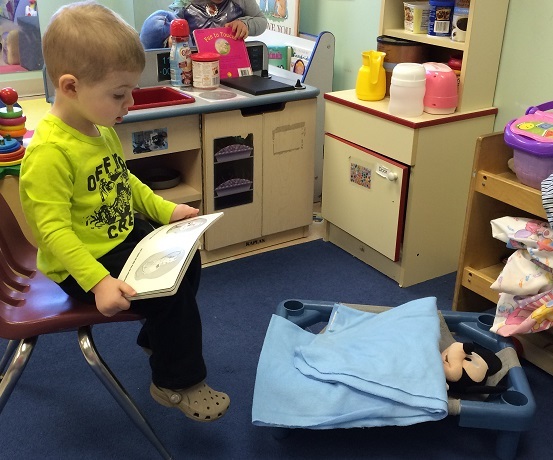 Brayden Knapp, a toddler at Discovery Learning Center, reads “Good Night Moon ”to his pal, Mickey Mouse, just before rest time. This is one of Brayden’s favorite books. He likes to read it daily. The toddlers spend time every day looking at books and having books read to them, which helps to build upon their growing literacy skills. Discovery Learning Center has limited openings for children 18 months to 12 years old. If you are interested in a tour for more information, please call us at 695-4838. Discovery Learning Center is located in the Industrial Park in Phoenix. A private, non-profit agency, OCO’s many programs touch the lives of more than 24,000 Oswego County residents each year. One of Oswego County’s largest employers, OCO employs more than 550 people and boasts a volunteer force of 1,200. OCO strives to improve the quality of life in Oswego County by inspiring partnerships and providing services that empower people, support communities, and change lives.